Halloween is upon us, which means the empty store in the strip mall that used to be a Kmart or whatever is now filled with a spook-tacular variety of masks. Ones that are whimsical. Ones that are topical. But most of all, ones that will scare the jeepers out of you. Know who else fancies these masks? Goalies, those beautiful freaks of hockey. Through the decades, we've seen all manner of masks that are scary in concept and execution, sometimes featuring monstrous images and sometimes being terrifying in the simplicity. There's really nothing scarier than seeing a mild-mannered, completely average goalie suddenly being devoured by a ghost dinosaur. 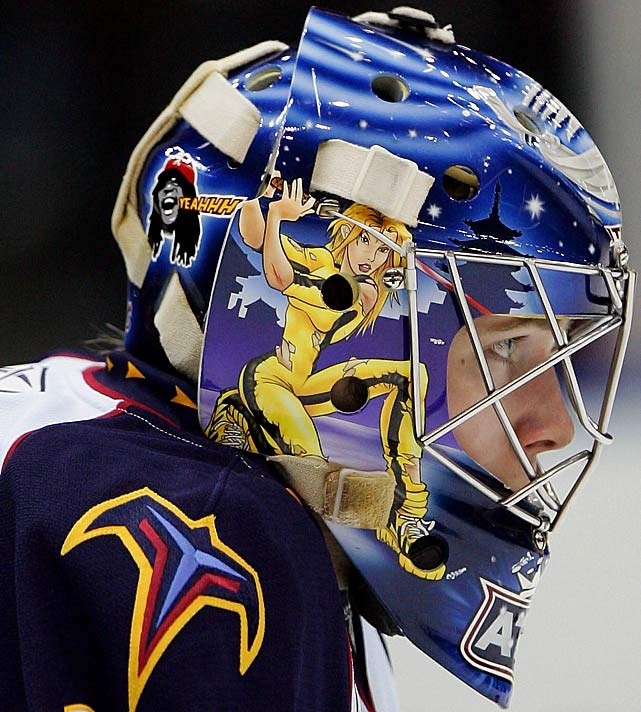 Lehtonen used to have some of the most innovative pop-culture masks in hockey, including a beauty that featured The Bride from "Kill Bill" and Lil Jon. This one, which centers around Heath Ledger's Joker, is his most frightening -- in particular when Lehtonen would ask if you'd like to see his disappearing-goalie-stick trick. Remember when music was awesome and scary, when you could read lyrics from an album and literally open up a gate to the demon world? Turek used variations of Iron Maiden's mascot, Eddie, on his masks, including this one on which heavy metal met the Blues. Nabokov's masks would feature snarling, evil skeletons next to great white sharks, which made them doubly scary. Most famous for having inspired the SyFy original movie "Sharkeleton," starring Tara Reid. It doesn't get much more meta than this: a goalie named Jason with a mask featuring Jason Voorhees in his iconic goalie mask. The sides of the mask featured Jason with a trench coat over a Colorado Avalanche jersey -- the psycho-killer Jason, not the goalie. Given the reputation of both professions, we felt the clarification necessary. This is probably another variation of the "Sandman" that Sanford had on other masks, but it's basically what Gandalf The Vampire would look like if he had spring allergies. Mason has a bit of a zombie fetish, having featured the ghouls on his Blue Jackets mask (as the military walking dead) and having donned one in Philadelphia that featured his own teammates as the undead. This one imagines the Founding Fathers and Betsy Ross as zombies, returning from the grave to protest the commercialization of Independence Day (we assume). The Lehigh Valley Phantoms goalie put the murderous clown Pennywise from "IT" on his mask, which also featured artist David Gunnarsson on a "missing" poster on the opposite side. This is awesome. 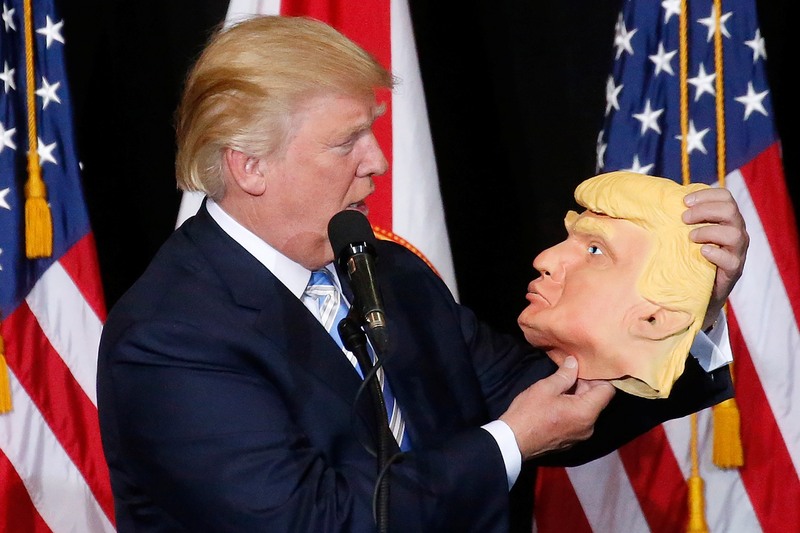 The kind of mask that makes one gloat. If you have it, you'll gloat too ... you'll gloat too ... YOU'LL GLOAT TOO, YOU'LL GLOAT TOO, YOU'LL GLOAT TOOOOOOO!!! You know what's scarier than a dog with demonic Cujo-rage rabies? A bear with demonic Cujo-rage rabies, as we see on this Rask mask. Dryden wore this mask in the WHA decades before he could properly be described as hockey's first juggalo goalie. Seeing this mask for the first time is basically a jump-scare in itself. Look at this thing. It wants to eat you so badly that it's bleeding from the eyes in anticipation. The other side of the mask reveals this is some kind of desert Sasquatch. We do not want to ever meet a desert Sasquatch, based on the available evidence. The catalyst for this iconic mask was Bruins trainer John "Frosty" Forristall, who painted 10 stitches on the mask where Cheevers would have been cut had he not been wearing it at practice. He painted another stitch whenever Cheevers took another puck to the mask. The result was a Frankenstein's monster-like, surgical effect, juxtaposed with cartoonish wide eyes. Plante is credited as being the first NHL goalie to wear a mask, and there's something really creepy about the simplicity of it, in sort of a Michael Myers, "Halloween" way. Even creepier: Plante's face was frequently scarier-looking than the mask that covered it. Simply one of the most frightening masks ever worn in the NHL. 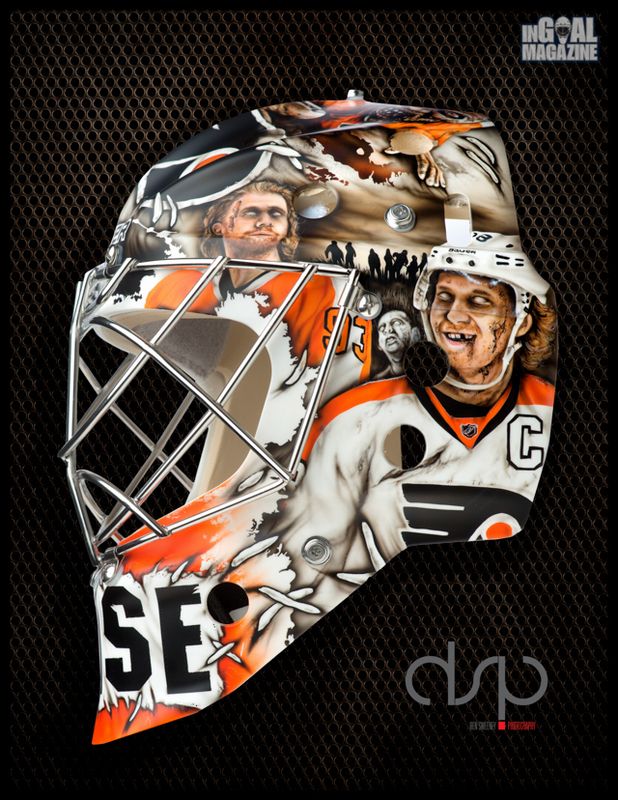 Bromley's nickname was "Bones," so he fittingly had his mask painted like a skull rather than, say, like David Boreanaz. It was also the perfect marriage between mask and uniform, as the Canucks' Flying V made him look like an attendant at a gas station of the undead. Meow. The origin of the "Tiger Mask," the scariest in hockey history, finds Gratton in a slump for the Rangers and switching masks to find one that would (in theory) produce wins. He was flipping through a copy of National Geographic on the team plane, saw a majestic tiger and asked his artist to create the snarling mask for him. The result: this horror show.